You’re looking for an internship and you discover UPMC’s Summer Associates Program. You do your research, realize the potential benefits of top level executive exposure, and apply. You hear back from a member of the Campus Programs team. The next step? The interview! You arrive downtown and knock the interview out of the park and land the job. Orientation: You’ll report to the U.S. Steel Building and have a general welcome/orientation with all of the Campus Programs team, as well as the other Summer Associates. 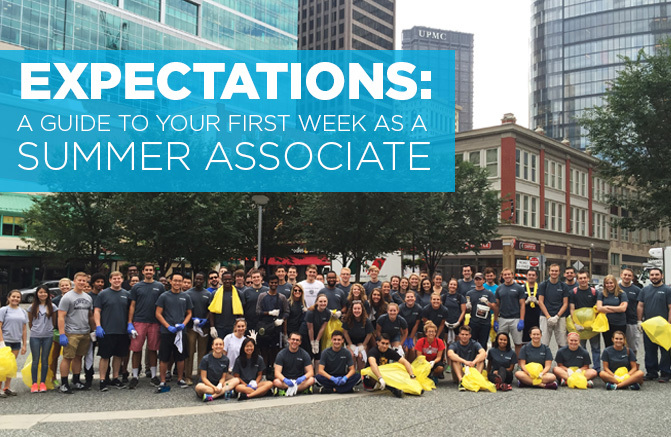 Not just the Summer Associates in your rotation, but all of the Summer Associates in every division! You’ll have the opportunity during the day to learn about UPMC, the history of the company, how they operate and the clients they serve. Networking: You’ll also have the chance to network with fellow Summer Associates and a few full-time employees, some in the notable rotational programs (FMR and ISDR). Throughout the first week of work you’ll have a great deal of time to learn the systems, and understand what work needs to be completed, but more importantly you’ll have the opportunity to network with a lot of UPMC employees. Not only will you have the opportunity to meet managers of different divisions, but also the occasion to network with upper level executives like the Executive Vice President and CFO, as well as the Corporate Controller. Your first week will be filled with meeting and greeting, so take advantage of every relationship you begin. Diving In: After orientation, you’ll report to the division you were placed in and you’ll meet your manager and their team. You’ll learn about the division, how they operate, and how they fit into UPMC’s structure. You’ll also learn the different software programs they use, and set goals with your manager. These goals won’t just concern what he/she expects of you, but also what you expect to gain from UPMC during the summer!